The MY NAME IS O launch party was a HOOT. Here, below, is a video I just uploaded of the two-minute reading I did from the book. Do you see the web address at the bottom of the screen – www.mynameiso.co.uk? Click through and take a look! Yes, thanks to the sterling work of Katie WebSphinx the all-new My Name Is O website is live at last! Katie is making final adjustments (and doing maintenance tweaks to my other sites) as I’m typing this. SNEE HEE HEE! SHINY THINGS! And a PARTY! …Ahem, sorry, rather excited. What I mean is, these are finished copies of my new novella for Barrington Stoke, MY NAME IS O. I knew about the stickers, which (NB) are fully removable and come off without leaving a mark. What I didn’t know was how the mirror effect on the cover was going to turn out. The answer is, very nicely indeed. To celebrate the book’s launch I’m having a party - tomorrow night (Fri Feb 3rd) from 7.30 at The Big Green Bookshop in Wood Green, London, England. For those who don’t know about the party already, if you’re reading this and you’re available then consider this a formal invitation: please drop by for a chat and a glass of something, it would be great to see you there! If you can’t make the party, then signed copies of MY NAME IS O (and my other books!) will be available to order from The Big Green Bookshop (here’s their website) from tomorrow night onwards until I’m back in Japan. The book’s cover price is £6.99. Samurai booksellers Simon and Tim will gladly arrange delivery to anywhere in the world, and postage inside the UK is free. 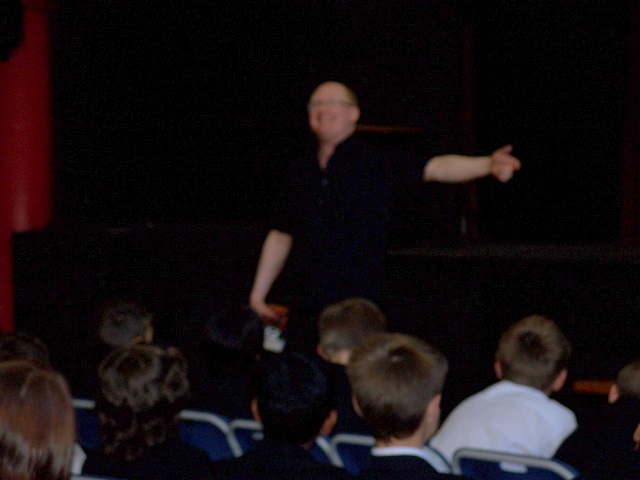 Here I am (above), gesticulating and grimacing as usual for the Year 8s of Meadowhead School near Sheffield. 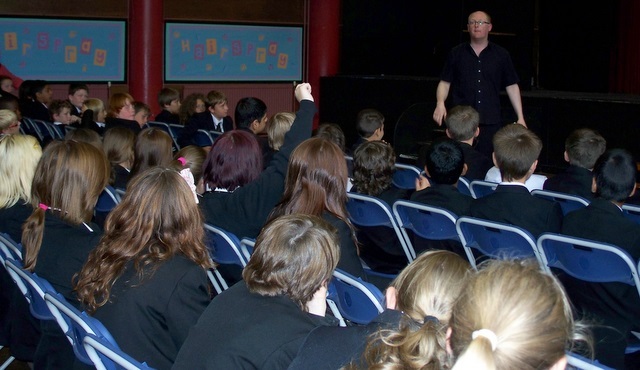 In this (below) I’m taking awesome questions from another group at Thistley Hough High School near Stoke-on-Trent. As anyone who’s been to one of my talks will know, bitter (and damp) experience has taught me to be careful to the point of mania about drinking water without making a mess and an idiot of myself. I’m proud of this next pic, because it captures me not spilling a drop! These were my last school appearances for quite a while. That’s partly due to the summer break of course, but beyond that it’s also due to a sinister masterplan I’m developing – the long-awaited realisation of a lifelong ambition of mine. I’ll explain more in future posts. Meanwhile I’d like to thank everyone at Meadowhead and Thistley Hough, and all the schools I’ve visited. I get a big kick out of school events, and after what’s now been five years of doing them pretty often I reckon six months without is going to feel very strange. A big thank you to everyone I met and spoke to today at Chilwell School in Beeston, Nottinghamshire for their warm welcome. The audiences for my two talks were my biggest in a while, and they were absolutely brilliant — enthusiastic, astonishingly pin-drop silent for the readings and full of awesome questions. At lunchtime in the library I had a thoroughly disturbing conversation about squirrels. For a taste of my feelings as regards that particular topic I refer you to this horrible short story. Steve Feasey, William Hussey, Stephen Deas and I will be teaming up for another Chainsaw Gang Extravaganza at The Stoke Newington Literary Festival this Friday 3rd June. 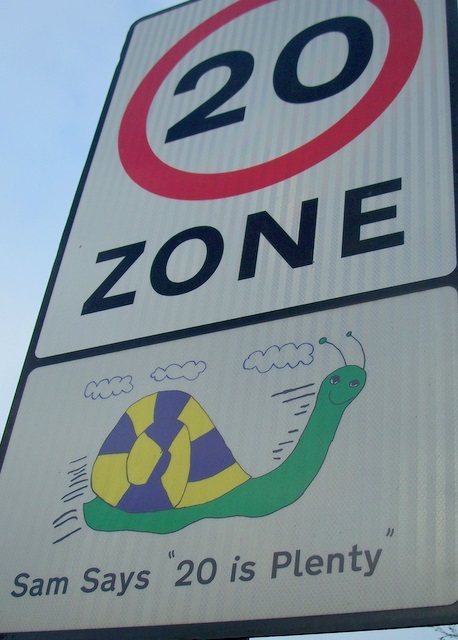 We’ll be doing our stuff from 2pm to 3pm (plus signing time) at The Gallery in the library on Stoke Newington Church Street, London N16 — unless the weather is fine, in which case (get this-!) we’ll be in the gorgeous GRAVEYARD just up the road: Abney Park Cemetery! Tickets for our event are £3, but the entire festival looks like it’s going to be a hoot. See you there? Hope so. A huge and gleeful THANK YOU to everyone I met and spoke to over this last week. 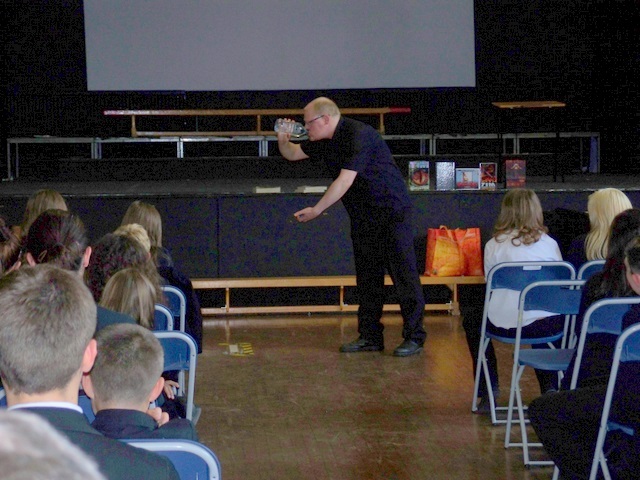 If anyone reading this would like to find out about how to arrange a visit from me to your school or library, you can find out all the details on my Contact An Author page, here. As for me, I’ve ended Book Week exactly as I always seem to do – namely by catching an ‘orrible cold! Today my head only seems interested in producing mucus instead of writing, so I’ve spent the afternoon updating my LibraryThing Review Page: hit the link for all my latest book recommendations. AhhhhPHLOOPHTCH! Ahem, ‘scuse me. 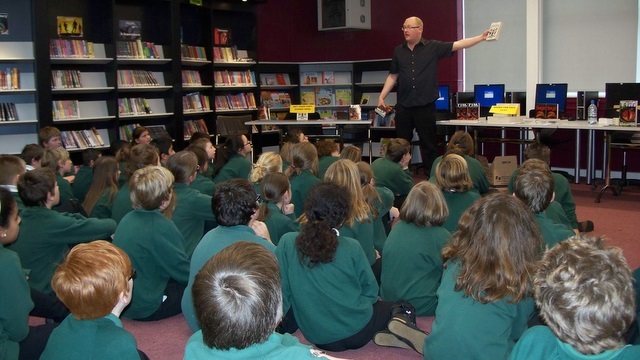 Book Week is upon us again, and I’m gearing up for three school visits this week: Ken Stimpson Community School in Peterborough, Heartlands High School in my neighbouring London borough Haringey and a long-awaited return visit to The Ridgeway School in Swindon. 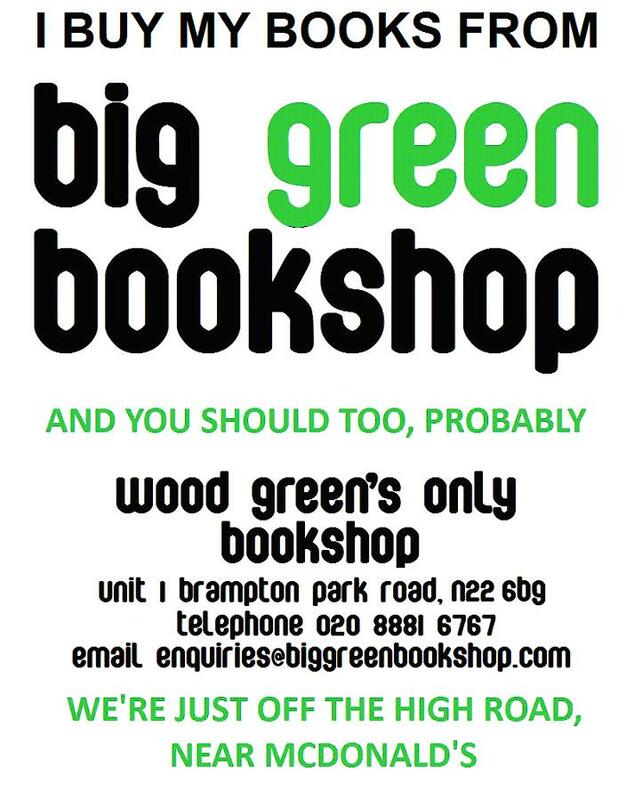 If anyone reading this would like to know how to buy my books and have them signed and personalized for you by me, then The Big Green Bookshop is the place to place your order. Call Samurai Booksellers Simon, Tim and Mark or contact them via their website: they’ll let me know, I’ll drop by the shop to sign the books, they’ll post them out to you wherever you are in the world. Easy. Bookshops – especially spirited independent ones run by people who love and care about books – are an all-too-rare treat to find on our increasingly homogenized high streets. Just like libraries, you have to use them or lose them. If you’re an author, Adopt A Bookshop. If you’re a reader, visit one today! It was awesome. 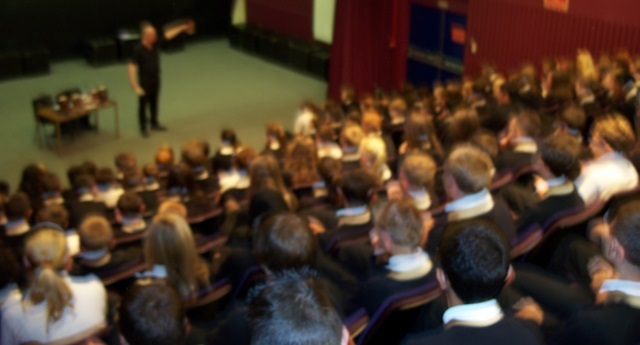 Both groups I spoke to – KS2 and KS3 students from various different schools in the area – were enthusiastic and charming. The video presentations by students on which books they thought should win were brilliant and the quizzes were ace, but the biggest thrill for me was witnessing the way these young readers discussed the shortlisted books – in depth and detail, and with passion. It was a great day and I was honoured to be involved. This Tues 15th Feb I’ll be testing my new short story Family out on a live audience for the very first time at Freedom of Expression, a fantastic variety night at The Green Dragon in Croydon. At half an hour in total this will be the longest public reading I’ve done so far, and by quite a stretch: as anyone who’s seen me do my stuff before will know, while my talks last around an hour, up ’til now I’ve kept my actual readings down to around five mins a go. This will be an experiment – and right now I don’t mind telling you I’m a little nervous about it! Still: also on the bill will be singer-songwriters Chris Parr and my friend the brilliant Adrian Taylor – so even if my own performance crashes and burns I still know it’s going to be a good night! At my visit to Bushey Meads School yesterday not just one but two of the young people I spoke to asked to have their first names used in my next book. I did my best to warn them that their names might go to characters who, say, eat children but, strangely, that didn’t seem to put them off. 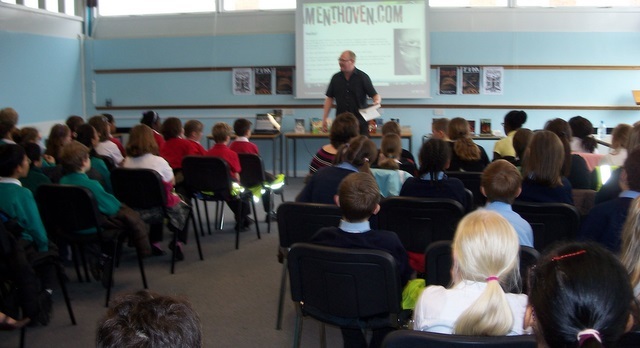 This was my last school visit of 2010, and a great one to finish off on. An enormous THANK YOU to everyone involved.